Cheap Custom Stress Balls Personalized in Bulk. Promotional, Bargain Prices for USA, Canada. Hearts, too. We supply stress reliever balls and stress reliever hearts in many colors, at lowest prices in the USA and Canada Our stress reliever balls and hearts are made of porous foam, covered with a smooth vinyl skin. You may imprint them in more than 1 color. Unit prices below include your 1-color custom imprint. Free artwork design. We will send you a proof for your approval before production. 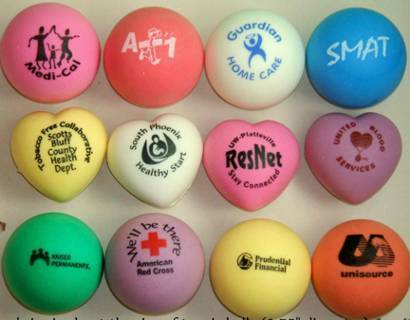 Hearts 0.99 0.83 0.75 0.69 0.67 0.65 Additional Imprint Colors: add $0.05 per color, per stress ball or stress heart. Second Side Imprint: add $0.20 per stress reliever. PRODUCTION TIME: 10 working days after art approval for 1 color imprint; 15 days after art approval for 2 color or second side imprint on either the stress reliever balls or hearts. COLORS: Yellow, blue, green, lavender, orange, red, raspberry pink, white, assorted. MULTI-COLOR IMPRINT: allowed: see the Price Table below. PRODUCTION TIME: 10 working days after art approval for 1 color imprint; 15 days after art approval for 2 color or second side imprint.